I’ve recently got very interested by the work JT Batson has been doing recently regarding the redesign of the Firefox update page. I’d like to share a few comments on the mock-ups JT presented on his blog. For this purpose I repost them here. They are work of JT and his team, and I recommend reading JT’s original post in which you can find them as well. The message of this page sent to users should be rather about the update, not the add-ons. Let’s sneak add-ons into it, but what interests users the most (and what justifies displaying this page) is whether or not the update was successful. So the most visible headline should say: Update successful. 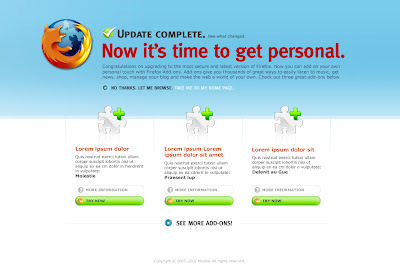 Then let’s explain what has just happened: Firefox has been updated. Everything went OK, all your data and settings are intact, and you’re using the latest and the most secure version of the browser. Congratulations! Keeping the link to the detailed release notes there is a good idea. Only then should we introduce add-ons. 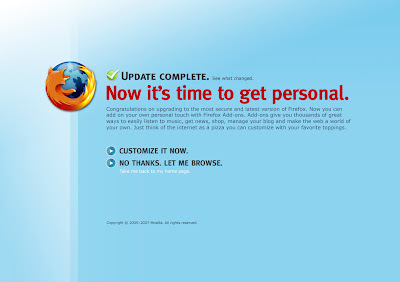 I think the headline should rather be a question (How about making Firefox suit you better? etc.) than an order. Let’s not make it another installation/update step. Add-ons let you add your own personal touch to Firefox. Listen to music easily, get news, shop, manage your blog — make the Web a world of your own. Just think of your browser as a pizza you can customize with your favourtie toppings. As you can see, I would also change ‘Just think of the Internet as a pizza’ to ‘Just think of your browser as a pizza’, because it is not the Internet we’re customizing, but the browsing experience, delivered by the browser. Then you have the two action links: Customize now and No, thank you. I’d change the first one to Show me a few examples, so that the user know that they won’t actually do anything yet by choosing this action. The second link, the ‘thank you’ one — I’d suggest simply leaving it out. After all, the ‘what’s new’ page is opened in a new tab, next to the homepage, so if a user wishes to discard it, they can simply close the tab. The goal of our second page (below) is to introduce the user to specific add-ons from the start. We think that even if these specific add-ons aren’t appealing, the user will quickly “get” what an add-on is and will be interested in seeing more. I understand the idea behind this mock-up, but again, I would rather see this page as informative as possible in terms of explaining what just happened with the browser. When I look at this mock-up, I tend to think of 3 ads, that I, as a user, should simply discard. 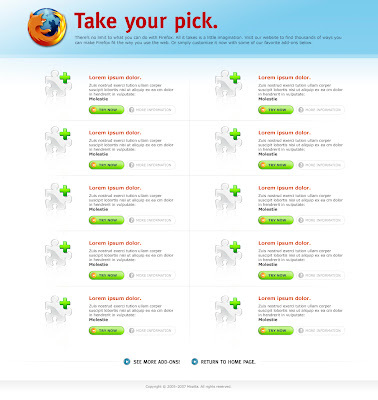 Also, imagine you’ve been using Firefox since 2.0 only — it still means you have already seen this page 7 times. I don’t actually have a clue whether on the 7th time I would totally ignore the proposed add-ons as ads, or maybe wonder what add-ons I will see this time on the page. This one I like a lot :-) It does exactly what it should do. I’m also starting to like the idea of proposing 3 popular extensions on this page (JT’s second mock-up). I’d love to hear your suggestions on how to include them in my mock-up, as well as your opinions about the idea behind it.